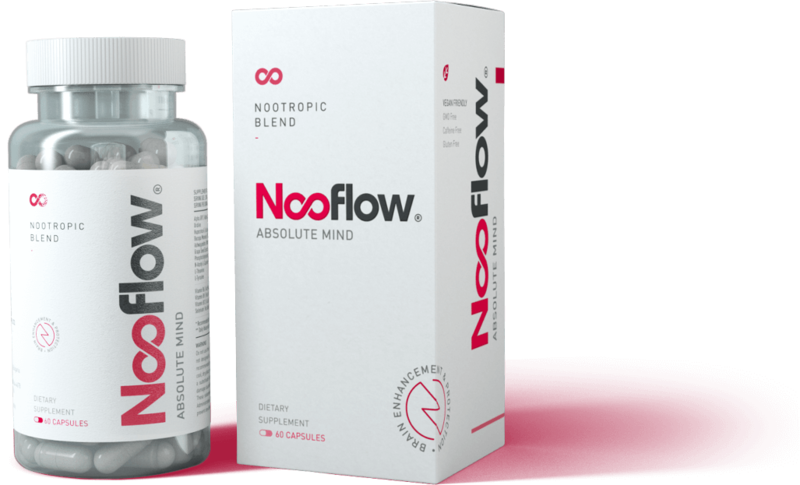 NOOFLOW®’s specially designed formula is based on 14 ingredients, which activate your brain, improve mental capabilities and general well-being. * AlphaSize® is a registered trademark of CHEMI Nutra LLC. Alpha-GPC (Alpha-Glyceryl Phosphoryl Choline) is a natural choline compound found in the brain. It is an essential nutrient that plays a critical role in memory formation, learning and cognitive functions. This micronutrient is a direct precursor to the neurotransmitter Acetylcholine, which is responsible for neuroplasticity, logical reasoning and the ability to concentrate. Alpha-GPC 100% not only makes your brain work faster and better, but also reduces stress levels, improves your mood and overall well-being. As a neuroprotectant, it promotes a healthy growth of synapses throughout the brain, which upturns the performance in your work, studies and other daily activities. Alpha-GPC 100% is the perfect choice for people who want to live an active life, improve their brain capacities and get the best of them! This applies both physically and mentally. Alpha-GPC has been approved as a safe nootropic supplement by the FDA (Food and Drug Administration) in the USA and EMA (European Medicines Agency). Uridine is a component of RNA (Ribonucleic acid) and has a significantly positive effect upon human mental and physical health. This supplement increases choline levels in the brain and blends perfectly alongside the choline sources (like Alpha-GPC in our nootropic stack). Therefore, Uridine can improve brain functions, support memory and increase synaptic plasticity by making it easier for your neurons to form new connections. By repairing dopamine receptors, Uridine increases the flow of dopamine, a neurotransmitter that positively influences mood and motivation. It also improves your ability to focus and maintain attention. It is the perfect supplement for students and other people who are required to have high levels of concentration while performing their jobs and daily routine. One serving of NOOFLOW® contains 1 milligram of Lycopodium Serratum Extract, also known as Huperzia Serrata (or Chinese Club Moss). This extract quantity contains precisely 15 micrograms Huperzine A – a potent, natural nootropic compound. Huperzine A promotes greater neuroplasticity, which means your brain is better able to adapt, learn and store new information. It keeps Acetylcholine levels in the brain high, which is of vital importance to learning, information processing, memory formation and concentration. Acetylcholine is also directly linked to your problem solving skills, as well as the ability to adapt to new situations. It also boosts your working memory capacity and mental clarity. Acetylcholine levels usually decrease as you age, but this decline can be efficiently reversed by using supplements such as Huperzine A. Some recent clinical lab tests have discovered that Huperzine A can provide significant protection against free radical invoked cell toxicity. It protects the neurons against oxidative damage caused by glutamate toxicity and iron overload. By including this supplement in your regular diet, you look into a more active future; both mentally and physically. Bacopa Monnieri, also known as Brahmi is a highly effective natural nootropic, popularly used in Ayurveda. It reduces stress and anxiety levels, thereby leading to an improved mood and overall well-being. It is a natural antioxidant that rejuvenates the activity of other potent brain enzyme antioxidants, hence proving to be a powerful weapon against oxidative stress and brain cell damage caused by free radicals. When used on a regular basis, Bacopa Monnieri promotes better communication between neurons, improves short and long-term memory, empowers cognitive functions and gives focused concentration and mental alertness. 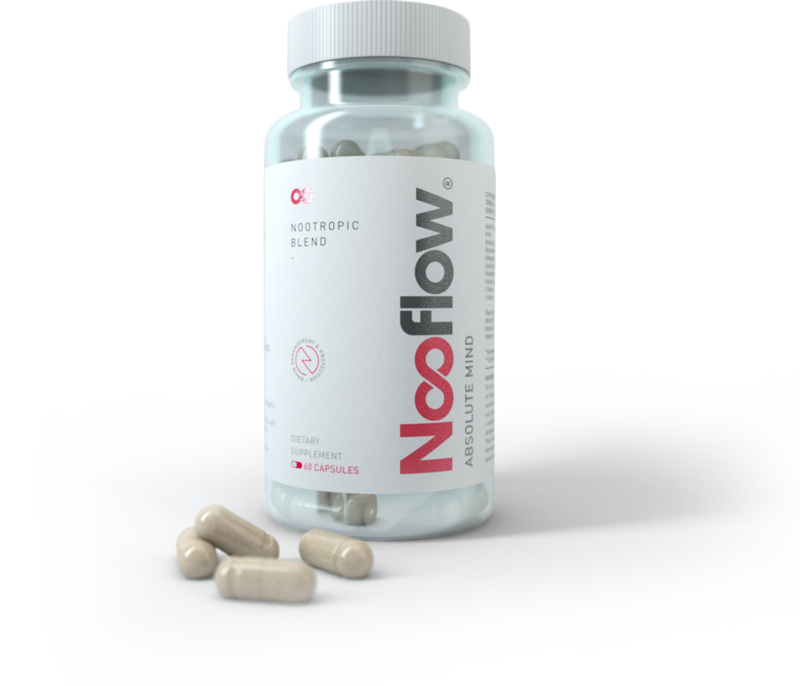 Being one of the active ingredients in NOOFLOW®, its complex action is further enhanced, and effectiveness maximized due to the synergistic activity of all other ingredients in our premium nootropic blend. Bacopa Monnieri is the perfect supplement for individuals suffering from stress, sleep disorders, memory lapses as well as people going through tense phases that cause physical and mental exhaustion. Withania Somnifera is another herb that has been used in Ayurvedic medicine for centuries. It is known to provide a number of physical and mental health benefits. It is a powerful antioxidant and eliminates free radicals from the brain and other major organs. Also known as Ashwagandha, it is very effective in treating anxiety, both physical and mental stress, and works as a natural antidepressant. Scientists have carried out many studies on Withania Somnifera, both inside the laboratory and with human subjects. One recent research revealed that Ashwagandha root extract given to healthy individuals improved cognitive functions and reaction times by a remarkable magnitude. When combined with other potent natural nootropics, its brain enhancement properties are further increased. Other significant positive effects of Ashwagandha include improvement in sleep quality, thinking ability, focus levels, reduction of inflammation and stronger immune system. Grape Seed Extract is a powerful, natural antioxidant that is known to dilate blood vessels and improve blood flow in the entire body (thus enhancing focus levels and cognitive functions). Furthermore, it reduces oxidative stress and preserves mitochondrial function, leading to additional mental and health benefits such as improved mood and overall well-being. Grape Seed Extract strengthens the immune system, promotes better mental and overall physiological health. It protects the body from premature aging and reduces oxidative-stress levels due to its high proanthocyanidins concentration. Studies have shown that the antioxidant power of proanthocyanidins is 20 times greater than vitamin E and 50 times higher than vitamin C.
The combination of highly potent natural Nootropics together with the health and mental benefits of Grape Seed Extract, makes NOOFLOW® one of the most complex and efficient dietary supplements for brain power and health. N-Acetyl L-Carnitine is a well-researched, acetylated form of the amino acid L-Carnitine that is produced naturally within the body. It is known to easily cross the blood-brain barrier, thus providing a significant boost to mental energy and focus levels. Studies show that N-Acetyl L-Carnitine increases the levels of Acetylcholine, the neurotransmitter with a large number of brain benefits. High Acetylcholine levels lead to a substantial improvement in cognitive capabilities. This includes increased learning ability, more efficient memory formation, faster speed of recall, increased attention and focus levels. N-Acetyl L-Carnitine is not only beneficial for cognition, but also essential for the overall health of the brain. It has important neuroprotective properties and drastically improves electrical signaling between the neurons by preventing toxins and harmful chemicals from damaging brain cells. These health and brain benefits make N-Acetyl L-Carnitine an essential supplement for athletes, seniors and adults who need an extra dose of energy in their daily routine. Researches have shown L-Theanine to be very effective against anxiety, panic attacks and depression. Unlike other natural relaxers, it doesn't leave you tired. Instead, it removes the symptoms of anxiety (as well as other depressive conditions) allowing you to face the day to day challenges with full energy and vigor. Many studies show that L-Theanine also has properties that help in enhancing brain performance. It increases attention, improves memory and overall cognition. Additionally, this amino acid has the exceptional ability to cross the blood-brain barrier, meaning it is able to get to the brain directly. L-Tyrosine is metabolized by the body to produce the neurotransmitters Dopamine, Epinephrine and Norepinephrine. It plays an important role in uplifting mood and providing motivation. It actively suppresses depressive states and anxiety. Studies show that L-Tyrosine replenishes cognitive resources and essential brain chemicals when they get used up. Hence, it can be extremely helpful in stressful situations when brain resources get depleted at much faster rates than usual. Additionally, when used on a daily basis, this non-essential amino acid can boost brain energy, focus levels and mental clarity. L-Tyrosine helps in fighting fatigue and provides an additional dose of mental and physical energy throughout the day. Phosphatidylserine is a phospholipid found in high concentrations in the brain; it is essential for the brain itself to function at a normal rate. It helps the brain to metabolize glucose and release neurotransmitters such as Dopamine and Acetylcholine. Therefore, Phosphatidylserine can be useful in enhancing serious brain functions such as memory, learning, attention, focus and processing speed. Furthermore, it is very beneficial for relieving depressive symptoms and lowering stress and anxiety levels. As a component of the cell membranes, Phosphatidylserine plays a key role in the ability of brain cells to send and receive chemical communication. Moreover, it supports the brain’s ability to repair old cells and generate new ones (neuroplasticity) and helps the brain cells to remain adaptive and react efficiently to stressors (brain cell fluidity). Maintaining high levels of this phospholipid improves a series of cognitive functions, allows the brain to stay healthy and offers protection from age-related cognitive decline. The modern world is generally rich in calories, but not so much on other necessary nutrients and essential minerals. Selenium is one of the important micronutrients found in deficient amounts in the modern industrial diet. Low intake and a deficit of Selenium can lead to serious chronic health problems. This trace mineral serves as a key to the body’s master antioxidants whose primary biological role is to protect the organism from oxidative damage. Selenium also has a massive effect on the brain function. It is necessary for the nerve cells to create glutathione, one of the brain’s most important antioxidants. Additional benefits of Selenium include enhanced immunity, well regulated thyroid function, increased longevity and overall well-being. This important micronutrient is included in our nootropic blend in healthy amounts. It forms an essential base for the brainpower boosting effects of NOOFLOW®. Since the body cannot produce Vitamin B6 on its own, it is essential for it to be supplied to the body through diet or supplements. According to government studies, merely one-third of adults get adequate amounts of this vitamin by means of their diet. Individuals low on Vitamin B6 tend to be more prone to depressive and mental disorders. Deficiency can also affect cognitive functions of the brain in all age groups. Maintaining high levels of Vitamin B6 in the body effectively increases communication rate between brain cells, boosts alertness and mental clarity. It helps to keep healthy nerve function and contributes to a healthy sleep cycle. Additional benefits are improved metabolic rate, stronger immune system and increased mental and physical energy levels. Since Vitamin B6 is depleted at faster rates in stressful situations, it is important that sufficient amounts are available at all times for the normal function of the brain. The presence of this vital vitamin in NOOFLOW ensures we can go through our tense daily routine with enough reserves at our disposal. Vitamin B9 contributes effectively to the proper brain and nerves function, improves memory and fights against cell aging. Similar to all vitamins from the B group, Folic Acid helps the body to convert carbohydrates into glucose, which serves as the major energy source for the brain and body. Therefore, Vitamin B9 improves brain energy levels, mental clarity and decreases stress-related fatigue. The combination of Vitamins B9 and B12 in NOOFLOW® can be of significant advantage to cognitive abilities as well as help maintain the ideal function of nerves at every age. Deficiency of B9 and B12, on the other hand, is directly linked to poor cognitive performance and brain shrinkage in adults. Additionally, Folic Acid is beneficial against anxiety and depression, reduces chances of suffering a stroke and age-related memory issues. This is one of the most important vitamins of the B group. Vitamin B12 supports healthy brain function, improves memory, increases attention span and concentration. A deficiency of Vitamin B12 can cause long-term damage to both the brain and nervous system. If you take Vitamin B12 on a daily basis, you will drastically increase your level of mental energy, sleep better and also reduce the symptoms of anxiety and stress. Designed for optimal brain performance. Encapsulated and Manufactured Exclusively for © CORPOLABS Ltd. by LABORATORIOS VIRENS S.L. Barcelona, Spain. Formulated and Designed by © CORPOLABS Ltd. 14 Tsar Osvoboditel Blvd., Landmark Center, 1000 Sofia, Bulgaria. CORPOLABS Ltd. © 2017 All rights reserved.